As we explained in the first installment of our Corolla/Sprinter history, the first (E10) Toyota Corolla was launched in 1966, followed in 1968 by the Sprinter coupe, which in Japan subsequently became a distinct (albeit still Corolla-based) model line sold through a separate Toyota Auto dealer network rather than through Corolla Stores. In 1972, Toyota added sportier versions of the second-generation (E20) Corolla and Sprinter coupes, dubbed Corolla Levin and Sprinter Trueno, powered by the Yamaha-developed DOHC 2T-G engine. The TE27 Levin and Trueno were not widely exported, but proved successful enough (both in sales and on the racetrack) to continue through the third generation (the 1974–1979 E30/E40/E50/E60 Corolla and Sprinter) and into the all-new fourth generation (E70), launched in Japan in March 1979. 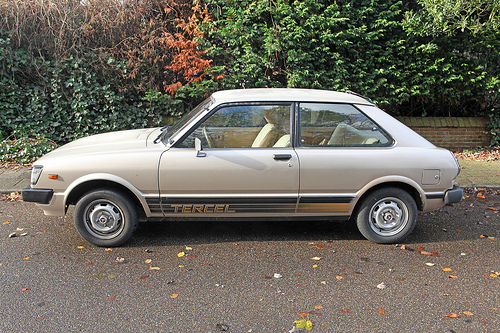 The 1979–1983 TE71 Corolla and Sprinter DOHC models (now available in most Corolla/Sprinter body styles, not just coupes) represented something of a departure from the decidedly non-athletic specifications of other Corollas. The twin-cam TE71 models were still RWD cars with live axles and recirculating ball steering, but featured a faster steering ratio, a stiffened suspension with front and rear anti-roll bars, four-wheel disc brakes, a five-speed gearbox with a shorter axle ratio, and the 1,588 cc (97 cu. in.) DOHC 2T-GEU engine with electronic fuel injection — still a novelty in that class. The DOHC Corollas and Sprinters sold in only modest numbers in Japan, were not officially exported to the U.S., and appeared in only a few European markets (and then generally using carburetors rather than fuel injection). However, the twin-cam cars were quite successful in sedan racing and other forms of motorsport, spicing up a popular but bland subcompact known more for sensible, reliable transportation than sporty flair. Work on the fifth-generation E80 Corolla and Sprinter began in the spring of 1979, soon after the launch of the fourth-generation cars. 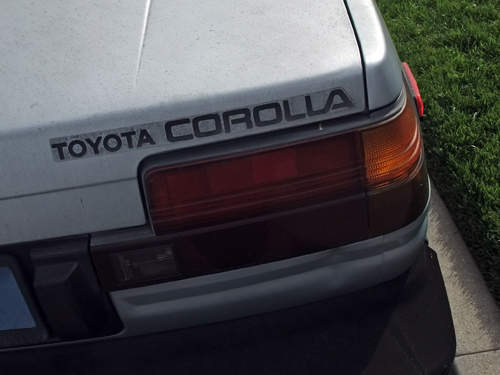 At that time, the future of the Corolla was the center of a heated internal debate. The issue was not whether the Corolla and Sprinter should continue — by that time, their combined sales were around a million units a year worldwide — but whether they should remain RWD or switch to front-wheel drive. By then, front-engine, front-wheel-drive (FF) layouts predominated for smaller B-segment cars, but there was as yet no clear consensus in the C-segment. The Nissan Sunny (a.k.a. Datsun 210), the Corolla’s chief rival in the Japanese market, had for the moment retained rear-wheel drive, but the Honda Civic was FF, as were many of the French, German, and Italian C-segment cars with which the Corolla now competed in Europe. Toyota approached the FWD question cautiously. The company’s first FF production cars, the AL10 Tercel and its Corsa twin, had bowed only about six months earlier, supplementing but not replacing the similarly priced RWD Starlet. While front-wheel drive offered clear packaging advantages as well as the prospect of better ride quality (thanks to the elimination of the heavy live axle), the Corolla design team was understandably wary of making such a dramatic switch with the company’s bestselling car. It’s easy to criticize such conservatism, but there’s no denying that cars that sell as well as the Corolla did in the late seventies put their makers in a tricky position: If subsequent generations evolve too little, customers may desert you for newer, more modern products, but changing too much may leave the golden goose with a nasty cough. Compounding the dilemma was the fact that the Corolla and Sprinter enjoyed a quite startling level of customer loyalty. Not only did a lot of people buy Corollas, many of those customers — in Japan, some three out of four — came back for seconds, which made it particularly crucial to avoid alienating existing customers. Even if buyers proved amenable to idea of a FWD Corolla, making that switch with such a high-volume product promised to be very expensive. The retooling costs alone were estimated at more than ¥120 billion, roughly $600 million at 1979 exchange rates and a good deal more than Toyota had originally paid to build the Takaoka plant where most Corollas and Sprinters were assembled. That was a daunting amount of money even for a company as large as Toyota and did not include the actual development costs of the new model. By the end of the year, Toyota’s leadership had conceded that an FF Corolla would shortly become a commercial necessity, but that still didn’t address the tooling cost problem. The eventual compromise was to make the transition in stages. Sedans and hatchbacks were given first priority, since they appealed to family buyers who put a premium on interior space and comfort. The coupes, for which packaging efficiency wasn’t a major selling point, would remain RWD for another model cycle, as would the comparatively low-volume station wagons and vans. We don’t imagine this was really any cheaper in the long run, especially accounting for inflation, but it did obviate the need to swallow the whole expense in one gulp. Toyota would take a similar approach with the larger Carina/Corona/Celica platform, retaining rear-wheel drive for certain models for several years after the rest switched to front-wheel drive. 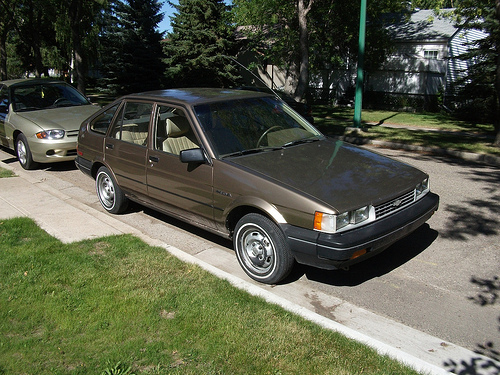 The bifurcated fifth-generation Corolla and Sprinter lines debuted in Japan in May 1983 and went on sale in major export markets later that year as 1984 models, although the E70 sedans continued in some export markets for at least another year. Four-door sedans and five-door hatchbacks rode the new FF E80 platform, which featured transverse engines, rack-and-pinion steering, and fully independent suspension with MacPherson struts front and rear. All FF Corollas and Sprinters except the diesel now used variations of the OHC A-system engine previously introduced on the Tercel, offered in 1300 (1,295 cc/79 cu. in. ), 1500 (1,452 cc/89 cu. in. ), and 1600 (1,587 cc/97 cu. in.) forms. FF cars carried the chassis codes AE80 (for 1300s), AE81 (for 1500s), AE82 (for 1600s), or CE80 (for diesels). Coupes, offered in two-door notchback and three-door Liftback body styles, retained rear-wheel drive and rode an updated version of the previous live axle chassis, but shared the FF cars’ rack-and-pinion steering and A-system engines. The RWD coupes carried the chassis codes AE85 (for 1500s) and AE86 (for 1600s). Corolla station wagons and vans got a mild update later in 1983, but retained the E70 body and chassis with RWD and Hotchkiss drive rear suspension. In many markets, the wagon and van also retained the older pushrod K- and T-system engines, which were not offered on the E80 cars. 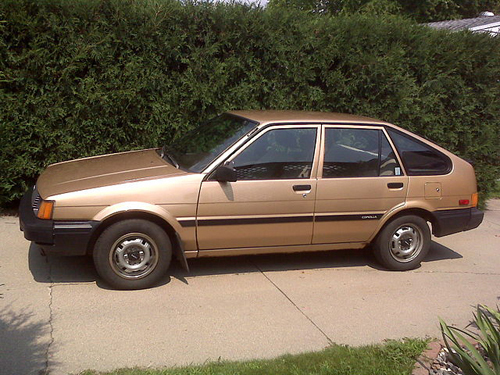 The Sprinter Carib station wagon actually rode the platform of the smaller AL20 Tercel/Corsa/Corolla II, whose longitudinal engine layout better lent itself to 4WD. 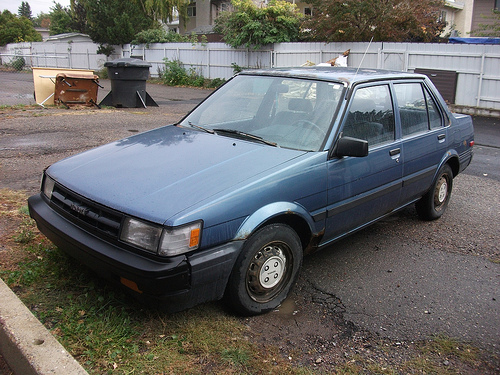 In late 1984, Toyota added an additional FF line with three- and five-door hatchback body styles. Those cars, dubbed Corolla FX in Japan and North America, were based on the FF sedan platform and shared the same chassis codes, but had sportier styling. Wow! What a great and detailed history you have written. Thanks. This was truly well worth the wait! Very comprehensive article – the AE101 Levin and Trueno shared a dashboard with a 4 door hardtop called either the Sprinter Marino or the Corolla Ceres, some of which also carried the 20V engine. A friend of mine ran a few of these cars, and the early manual ones definitely needed a 6-speed gearbox – you also had to be a skilled driver to rein in some of the torque steer. The boy racers graduated from the Suzuki Swift GTi to these in the late 1990s when they became available as foreign used cars in the Barbados market. There are still a lot of them around in varying stages of tune – it’s become increasingly difficult to find one that’s completely standard. Thanks, Dave. It hadn’t occurred to me that the Levin and Trueno dash was the same as the Ceres/Marino, but I looked it up and you’re quite right. I don’t think a lot of my U.S. or European readers will probably have heard of the Ceres and Marino, so I added a photo. Four-door “hardtops” like these were very popular in Japan for a number of years, going back to the late seventies. Most were not actually pillarless hardtops in the traditional sense, but they approximated that look by concealing the B-pillars (designing them to be thin in profile, painting them black, and putting them behind the door windows rather than between them), using frameless door glass, and sometimes adopting a more coupe-like roofline. A couple of examples with which readers may be more familiar include the ’90s Integra four-doors, the Lexus ES250 (which I believe was based on the JDM Camry Prominent hardtop), and the last U.S.-market Mazda 929. 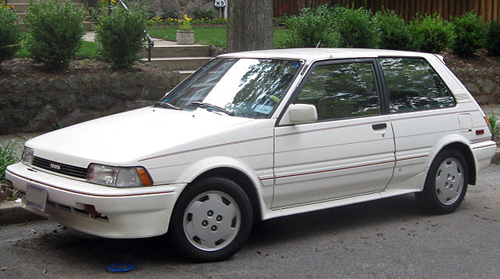 The Corolla Ceres and Sprinter Marino were offered in three grades (F Type, X Type, and G Type) that approximated the AE100/AE101 Levin/Trueno S, SJ, and GT grades in engines and equipment. There wasn’t an equivalent to the GT APEX or GT-Z, so as far as I know you couldn’t get a Ceres or Marino with Super Strut or the 4A-GZE engine, but as you mention, the G Type did have four-wheel discs and the 4A-GE TWINCAM20 engine. You could also order a sports package that included the coupes’ spoilers and other cosmetic bits, so a properly equipped Ceres G looked and performed a lot like an AE101 Levin GT. It looks to me that the Super Strut suspension worked by simply divorcing the strut from the steering, as with Ford’s RevoKnuckle on the Focus ST and GM’s HiPer strut on the Regal GS/Insignia and that the extra lower arms allow better steering geometry and reduced offset, a la BMW’s double pivot and the lower-half of Audi’s four link design. It probably also induces camber gain, as you speculate. You’re right — I hadn’t previously looked closely at the layouts of the RevoKnuckle or HiPerStrut (or whatever Renault calls theirs), but the basic principles look to be very similar, just executed a little differently in each case. I’ve been studying these systems more closely and Super Strut was actually somewhat more complex than the current HiPer Strut, RevoKnuckle, and PerfoHub. The newer setups have the relocated steering axis and reduced spindle height, but Toyota also did something very complex with the way the strut extension is pivoted to the rear lower arm to allow more camber gain. The GM, Ford, and Renault setups give a little more camber gain, but looking at the way they’re set up, I’m reasonably confident that it’s not as much as Super Strut provided. The tradeoff is that they’re also not as complex or as expensive and will hopefully be more reliable. Love this site! I love the Levins from start to finish. I own an AE111 Levin with the 20 valve blacktop and man isn’t it fun to drive! Several of the AE86 Levins that competed in the Australian Touring Car Championship in the mid to late 80’s are now racing in historic touring car racing – they are great little cars! My mostly stock 4A-C powered USDM AE86 with the manual transmission (slightly modified intake/vaccum setup and rear muffler delete ,keeping catalytic converter) has hit GPS Verified 101mph on flat ground, I’m sure if it was a little fresher (mine has 230k miles) it might hit 105. That’s getting close to 5,000rpm in 5th which is right when peak power starts to fall off, so anything beyond that would be stretching it. Thanks, I enjoyed the article… I’ve had my AE86 Trueno for 23 years now… Handling in stock form was pretty scary. Not sure how they got the factory JDM model to 2090lbs. Mine fully stripped for racing with no interior and sweating every gram is still 2030lbs. I’m a little puzzled by the JDM curb weights myself; I’m not sure what Japanese vehicle regulations require in terms of fuel and fluids in those calculations, but the quoted figures seem consistently lower than what I’d expect from a fully equipped and fueled car. (That’s a frequent issue with manufacturer curb weights regardless of country of origin.) Unfortunately, there’s not much to be done about it short of putting the car on a scale or finding some reasonably neutral third party who has. For that reason, I tend to find factory weight figures of most use for comparison purposes — for instance, the weight difference between trim levels.